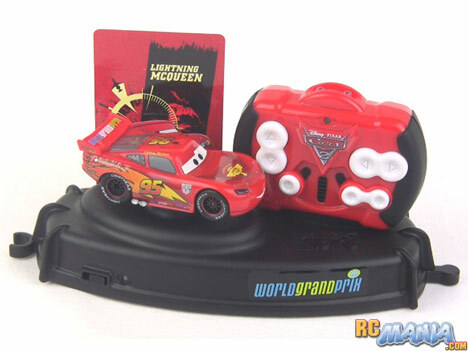 The Air Hogs brand came out with a whole slew of RC vehicles to go with the Disney/Pixar Cars 2 movie, and this Lightning McQueen model is from the smallest series they released. The set includes a display base with interlocking connectors at either side to connect to ones from other cars. What's most interesting is that the base is not only for holding the car, controller, and collectible character card, but it acts as a charger for the car as well. The perch that the car sits on is a kid-safe, fool-proof electrical plug that passes power from batteries in the base to the non-removable, rechargable battery inside the car. Looking at the Lightning McQueen car itself, it has a lot of detail and all of the sponsor stickers just like the "real" car in the movie. I especially like the detailing of the wheels, and the tires even have tiny white lettering on them. I can very honestly say that from the first few seconds of test-driving this Air Hogs Cars 2 Lightning McQueen car, I was happy with it. I test a lot of very different RCs with very different setups and very different ways that they feel to me as a user. In hobby-grade RC reviews for UltimateRC.com, I run small street cars that weigh 3 pounds, up to 8-pound, 40mph all-wheel-drive buggies, and sometimes even bigger monster trucks. In toy-grade RC tests for this site here, the differences in size and style are even more extreme than that, and the way one car drives compared to the next can be completely almost 100% different. This 1/43rd scale Air Hogs car felt natural right from the start. I didn't have to figure out how far in advance of a turn I needed to tell it to steer, I didn't need to figure out how slow I needed to go to keep from either spinning out or turning too little due to poor traction at one end of the car. It just responded to my control inputs perfectly. The ease of use was especially surprising to me given the speed of the car. For its size it is fast. Plus, it doesn't take it long to go from a standing start to hitting full speed. The rear tires are made from a soft rubber and a lot of the weight is in the back of the car, so it gets great traction on any smooth surface (it's just not designed to be driven on carpet, dirt, or anything rough). There's very little delay between when you push a button on the controller and when it does exactly what you asked. It starts quickly, stops quickly, and turns quickly. The Air Hogs Cars 2 movie 1/43rd scale mini RC cars are a joy in every way. This is how RCs should be done! I was a little worried about the unconventional twin motor, 2 wheel skid steer arrangement that I mentioned in the video, but when you actually drive the car, it just works. Everything about it works. The base makes a great display stand to keep on a shelf or desk, and it even holds the controller securely, and has a soft material that won't easily scratch surfaces. The charging port physically can't be connected wrong. The controller is small enough for young hands, and the buttons are very easy to push. If anyone from Spin Master is reading this, please, please make more cars just like this. Come up with a whole series of racers with futuristic looks, or do muscle car vs. import car battle sets. Make little racing arenas. Anything. Everything. This car is really great, and I want to see more like it!